"Why poetry? Poetry because my head fills up and I have make poems or I will shatter. Poetry because prose confuses me with its cargo, its burden of words. Poetry because poetry susurrates and moans and sighs and whispers and sings over my shoulder. Poetry because it is in every corner, around every dogleg turn, because it is dilemma and euphoria. Poetry because without poetry, what?" Wendy Taylor Carlisle lives on the backside of a hill in the Ozark Mountains. She is the author of The Mercy of Traffic (Unlikely Books, 2019), Discount Fireworks (Jacaranda Press, 2008) and Reading Berryman to the Dog (Jacaranda Press, 2000.) Chapbooks include "They Went to the Beach to Play" (Locofo Chaps, 2016), Chap Book (Platypus Press, 2016), Persephone on the Metro (MadHat press, 2014), The Storage of Angels (Slow Water Press, 2008), and After Happily Ever After (Two River Chapbooks, 2003). Her work appears in multiple anthologies. Reading it always fills me with awe. To write about oneself as if the past were fixed, I can’t conjure that. Imagine knowing what you know. Imagine remembering detail. For me, certain moments bob up, float on the oily surface, sink again. Any memoirist’s shelf-stock differs, of course, but there are usually white curtains and dressers with glass knobs. There is that chartreuse dress. There is a dark-haired sweetheart with that fetching birthmark. In my head, there is only a pell-mell tumble through the semi-connected that joins last year to this afternoon, slips the names of ex husbands into a list of serial killers, recites the classes of heavy machines, adds sixteen synonyms for spill. There was a childhood, I feel certain of that. There was a stack of comic books in the closet. There was a bike or maybe a horse. But I have no way to be sure. When I think of being an only child, I think of this. There is no one to check my recollection. No one to say, “The pony’s name was Chess” or “it happened like this.” By inclination and aptitude, I know best how to forget, love best excision. The dog of impossible recall lives here. In that way, my life has been like an industrial canal, sudsy, freighted with junk, the actions all going on underwater. "If I ever said my life was balanced, / what I meant was on the edge of a blade,' Wendy Taylor Carlisle writes. Kneeling on memory's sharp edge, we're invited to cup the blade to our lips, to drink deeply of a life well-lived and rendered into song." 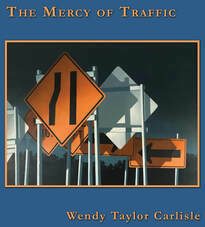 Click here to view and purchase other books written by Wendy Taylor Carlisle. The real night / Hasn't yet begun to fall. a safer form of the verb to be.